Why do Islamist extremists quit terrorism? Knowing the reasons for successful extremist deradicalization is one of the most important questions of our time, with implications as well for diminishing the appeal of radicalization. 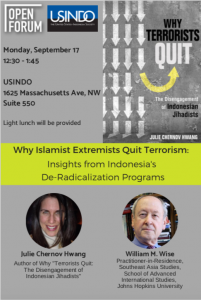 This is the question for which Julie Chernov Hwang seeks answers in her newly released book, Why Terrorists Quit: The Disengagement of Indonesian Jihadists. Indonesia offers examples of successful extremist deradicalization that deserve greater attention. Over the course of six years, Chernov Hwang conducted more than one hundred interviews with current and former leaders, operatives and followers of Islamist extremist groups in Indonesia. Using what she learned from these radicals, she examines the reasons that were most compelling in their rejecting physical force and extremist ideology, slowly moving away from, or in some cases completely leaving, groups such as Jemaah Islamiyah, Mujahidin KOMPAK, Ring Banten, Laskar Jihad, and Tanah Runtuh. 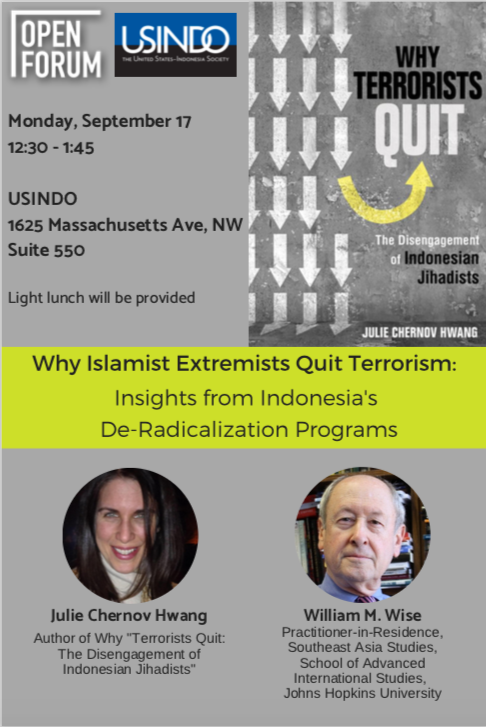 “Why Terrorists Quit” assesses the impact of public initiatives to encourage radicals to disengage, and follows the lives of five radicals from the various groups, seeking to establish trends, ideas, and reasons Indonesian radicals might eschew violence or quit terrorism. Dr. Chernov Hwang’s presentation will provide a clear picture of why Indonesians disengage from jihadist groups, what the state can do to help them reintegrate into non-terrorist society, and how what happens in Indonesia can be more widely applied beyond the archipelago. Dr. Wise will give introductory remarks on the topic and speaker and moderate a Q&A after Dr. Chernov Hwang’s presentation. Please join us on September 14 for this important event. Signed copies of Dr. Chernov Hwang’s book will also be available for purchase. To register, please kindly RSVP, or email to usindo@usindo.org or call (202) 232-1400 no later than Friday, September 14 at 3:00 p.m. to attend this Open Forum. Julie Chernov Hwang is an associate professor of political science and international relations in the Center for People, Politics and Markets at Goucher College. She was a 2012 Luce South East Asia Fellow at the East West Center and currently serves as Managing Editor of Asian Security. She is the author of Peaceful Islamist Mobilization in the Muslim World: What Went Right, published by Palgrave in 2009; Umat Bergerak: Mobilisasi Damai Kaum Islamis di Indonesia, Malaysia dan Turki, published by Freedom Institute in 2011; and the co-editor of Islamist Parties and Political Normalization in the Muslim World, published by the University of Pennsylvania Press in 2014. Her articles have been published in Terrorism and Political Violence, Asian Survey, Asia-Pacific Issues, Southeast Asia Research, and Nationalism and Ethnic Politics. Her book monograph, Why Terrorists Quit: the Disengagement of Indonesian Jihadists, is forthcoming from Cornell University Press in February 2018. Her special issue of Terrorism and Political Violence entitled Pathways into Terrorism: Joining Islamist Extremist Groups in Asia will also be forthcoming in 2018. Her new research program will highlight the processes and pathways by which Indonesians and Malaysians are joining Islamist extremist groups.